I had TOTALLY different idea for this week’s Photo Art Friday theme: HARDWARE. After I was done with it I had decided not to use it and skip this weeks PAF. I am overwhelmed by new information and by new ideas I got from today’s online workshop. I can’t sit still, I want to try it now, and I want to do it now!!! It doesn’t work like that, though. I do not have the skills nor I do have the equipment. Anyway I had tried a few new things today, and while editing and creating a BIG project my editing software quit on me, TWICE!!! I am so frustrated and angry I can barely stand anything and anybody. I had spent all day trying to figure out two editing softwares and putting together a cute project. After the first program quit on me, I just took a short break and started it all over. The second time I was almost done. I would say, there was a several minutes left to the moment in which I click “save the project”. Boom!!! Everything went to hell, altogether with my good mood. I just want to scream!!! I just hope that tomorrow I will have more luck with it, but the thing is that I wanted to have it done tonight… ugh… Now I am not going to think about anything else. I won’t be able to relax for the rest of the evening and I hate when that happens! I hope you guys had a better day! Oh! How frustrating! Hoping it will be better for you tomorrow. Sometimes I just hate computers! But if it weren’t for the computer, I’d have never met you! Sending you an email here soon! Hang in there with the project. Love the new series on selfless. I hope everything is getting better and easier for you. Oh I am so sorry that you’ve had a frustrating afternoon and that your project disappeared on you. I can fully understand your feelings having been there at some point. Not a fun thing at all. I do however like your fork piece and the different colors you showcased the fork with. Nicely done. I know exactly how you feel, when I get an idea in my head and I start working on it I like to keep going until it is finished. It can make for very late nights sometimes! I so know what you mean I’m tusssling with a new web site and yesterday I deleted a post that I had spent so much time on it…. software, hardware it always lets us down just when we need it most. Eats up our time and then produces nothing – though in your case the quattro of forks speak volumes and rather beautifully for the theme. Stick it! Here’s to a fresh start, and no problems. cool shots! Good luck! You are using GIMP? That can be frustrating, whenever I use it, I have to allow a certain amount of time since it always ends up taking longer than I plan. Hopefully you have a better day tomorrow!!! I am sorry, too, that you’ve run up against the dreaded uncooperative software monsters. I’ve had similar experiences and used to let that stop me. Now I decide this is an experience and I’m going to ride it where it takes me. I suppose that also is telling that I don’t KNOW when I go into it what RESULT I want. I have had many a project disappear [using Picasa] on me and sometimes a scan will come in with all sorts of things to BE undone. I don’t have a clue HOW this happens or HOW a photo from some other folder entirely finds its way into this folder. So I pretend it is the digital fiddling fairy urging me on adventures. You are clearly in a learning curve sort of place and I am grateful for your venting about your frustration here. Out Loud. With all these people listening!! I love the forks. I am certain, too, that one day NOT too far from Now you will look back at this experience and see how wonderfully it moved you where you want to go. I think after your year of self-portraits and a process that you created it is to BE expected you’ll have some growing challenges. This is what I am noticing myself since completing 366 Daze of Grace. Now I have to start fresh each day and move new muscles. Sometimes I, too, feel stretched BEyond Breaking and awfully sort. Very fun. Ha de gott i helgen. Oh … there are days like that … when nothing works. Well, your edit works beautifully. 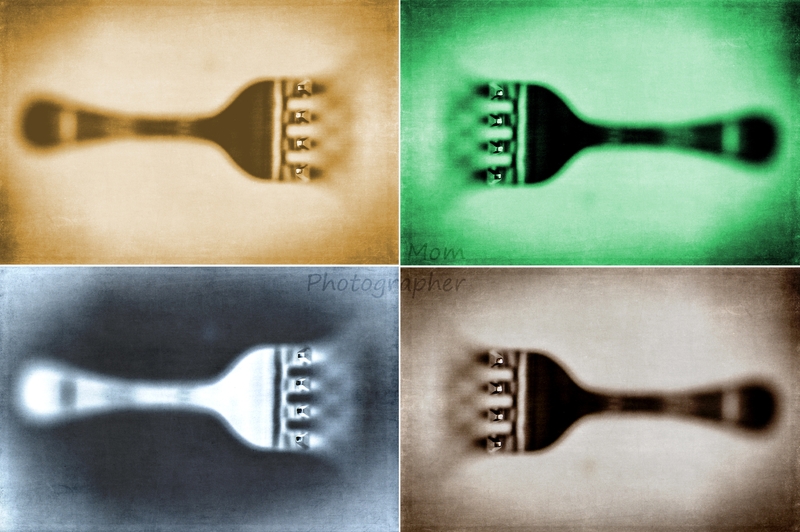 I just love your four different edits of the fork and I like the symmetry of presenting them as you have. Today I had a heck of a time with Picasa and Pixlr. Wonder what’s happening in photo editing lately? Your forks are great, though. Where would we be without this kind of hardware? Here’s to a better weekend! I hope your day got better..I like your photo art very much! frustration and anger are great motivators, so good luck with your project. I like what you’ve done with the fork. Very cool effects! I’m glad you shared them. Thanks for stopping by my blog. Now, I’m off to read your post about “self portrait”. I like your fork shot! Sorry to hear about your editing software. Hope everything works out.